Blood Suckers 2 Amilia is on Fire ! BIG WIN is coming home ! The game begins as the doors of the castle open and we find our heroine all dressed in red inside the kingdom. She stays by your side as you play, on the left hand side of your screen. She may use her crossbow to provide you special symbols which may allow you to make big winnings. Constantly in motion, she offers a very pleasant gaming experience. There are 4 low symbols represented by heart, spade, diamond or cross –shaped precious gemstones. As regards the medium symbols, they bring back the four characters found in the old version, but with a certain amount of retouching. The drawings are modern, colorful and so much more realistic! Amongst them, the vampiress with bat wings, the green faced vampire, the vampire with long blonde hair and the vampire dressed in red. The Wild symbols, which may replace all symbols aside from the Scatter and Bonus symbol, are represented by a golden jewel with a precious red gem. The Scatters are arrangements of red roses, their petals floating in the breeze during the game. BLOOD SUCKERS II™ is possibly one of the most well-made slot machines, its design will seduce players who enjoy modern graphics !However, the aesthetical characteristics of this video slot are not it’s only assets. Vampire game enthusiasts will be transfixed by this game which offers an RTP of 96.64% and offers various special features. This mobile slot has 25 winning bet lines (left to right combinations) consists of 5 reels and 3 rows , complemented with a variety of special features. The BLOOD SUCKERS II slot paytable distinguishes between the different symbols depending on the amount of winnings they generate. The 4 low win symbols (heart, spade, cross and diamond) may pay a maximum of 150 coins for every winning bet line of 5 identical symbols. 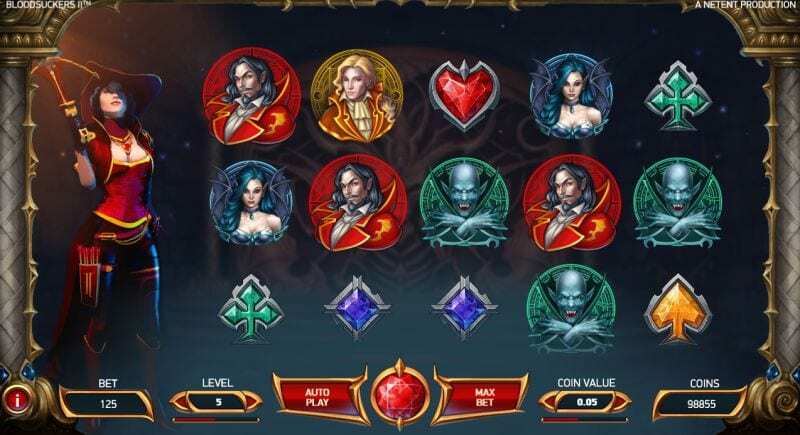 The medium win symbols may pay up to 200 coins per winning line of 5 identical symbols for the blue, green and yellow vampire, and 500 coins for the red vampire, which is the highest potential winning symbol. The Wild symbol may replace any symbol apart from the Scatter and the Bonus. It thus allows you to boost your chances of landing alluring combinations. This online slot machine displays an interesting RTP of 96.94% in the main game, alongside a tremendous maximum win of £122.290. 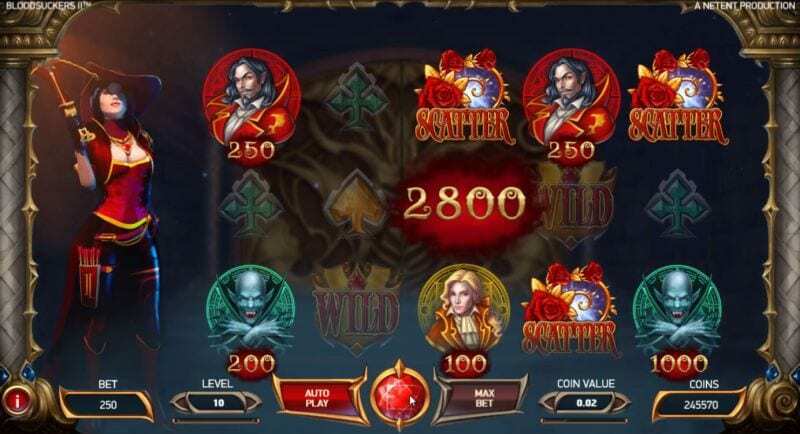 BLOOD SUCKERS II stands out by its numerous special features which offer a thrilling gaming experience: Free Spins, a Bonus Game and a Random Feature. The Blood Rose Free Spins, of which the name recalls the bright red roses which grow on the columns present on both sides of the screen, display a hit frequency of 0.54% and are triggered if 3 or more Scatter symbols are obtained. The latter may appear anywhere on the screen, regardless of the 25 winning lines. 3 Scatter symbols trigger 10 Free Spins during which the winnings are subject to 3x multiplier. One may win up to £324,600. This bonus feature’s gameplay is very well designed. We find ourselves in one of the many rooms of the vampire castle, in which coffins and chests are found. They must be carefully opened as so not to come across a white demon who puts the Bonus Feature to an end. 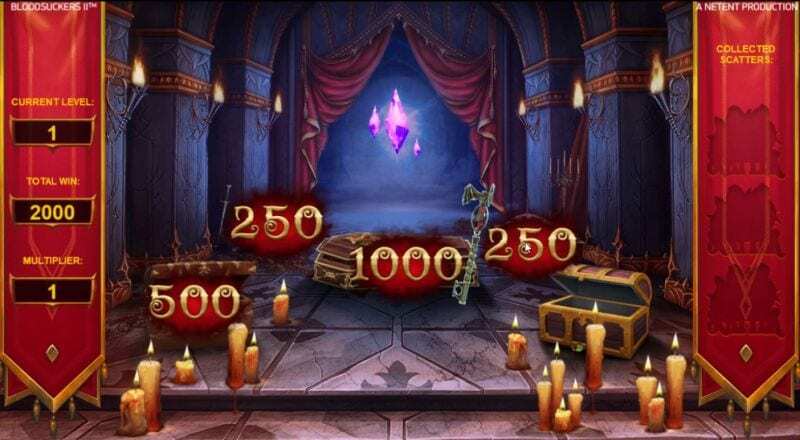 The chests and the coffins enable you to win coins, but also to collect treasures: some scatter which, as soon as 3 of them are obtained during the Hidden Treasure Bonus game, trigger 10 Free Spins. You may also uncover some keys which will enable you to move to the next level. There are 5 levels in this Bonus Feature for which the hit frequency is of 0.45%. A mega win equivalent to 1000 coins multiplied by the bet level is to be won! When in the main game, a golden bat holding a red stone appears, it is in fact the Scatter shot Feature. Our heroine, the vampiress Amilia the shoots at it with her favorite weapon and a Scatter symbol may appear, offering the player the chance of activating 10 Free Spins. NetEnt has really thought out everything in this game right down to the smallest detail. Proof of this is the bats which appear on the spinning reel as you wait to land a symbol which would grand you a special feature. After the incredible success of BLOOD SUCKERS™, one of the most popular fames amongst players, NetEnt takes us back once again to its vampire universe. 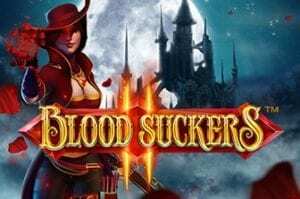 Launched in October 2017 – 8 years after the first version – BLOOD SUCKERS II™ tells us the rest of the story and enables us to follow Amilia in her quest for a hidden treasure. To this end, the Swedish slot providers has put all its know-how into a modern and elaborate design, yet reuses some of the features of the original game, namely the Free Spins and an original Bonus Game. The addition of a Bonus Shot Feature paired with an impressive payout of 96.64% and up to £324,600 (with Free Spins) to be won makes this slot even more exciting!